Hurricane Florence wreaked havoc on Southeastern North Carolina this fall, causing the widespread cancellation of university and local school programs. 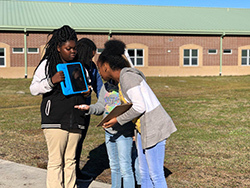 Faced with reduced participation in traditional marine science offerings, UNCW’s MarineQuest team partnered with Engineering Expectations to create a new curriculum focused on the science surrounding hurricanes and ways engineering can help mitigate impacts to homes and other structures. 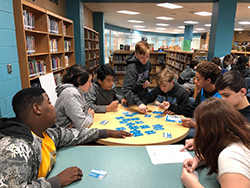 The program, designed for students in upper elementary grades through high school, was offered free of charge to schools beginning in October. More than 50 schools contacted MarineQuest for information about the unique offering. The first program was held October 23 at a local church in Swansboro County where Swansboro Middle School classes were held prior to the re-opening of schools. To date, MarineQuest has brought the program to eight schools, engaging 325 students. MarineQuest hosted a special hurricane program for families at UNCW’s Center for Marine Science on November 14, and 24 additional school-based programs are scheduled through January. MarineQuest’s curriculum is based on real-world data collected during Florence and past NC storms by UNCW scientists at CMS observatories including the Coastal Ocean Research and Monitoring Program (CORMP), NC National Estuarine Research Reserve and NC Coastal Reserve and the Lower Cape Fear River Program. The MarineQuest team teaches students to analyze data, sample water for pollutants and assess ways waves can change the shape of beaches. The program also includes engineering activities that challenge students to find ways to design safer homes, levee systems and pumps. MarineQuest director Erin Moran said the response from participating schools has been overwhelmingly positive. “Teachers are thrilled by the technology, data analysis and critical thinking aspects of the program,” she said. MarineQuest’s calendar for school-based hurricane programs is fully booked, but Moran encourages schools and teachers to contact MarineQuest at marinequest@uncw or 910-962-2640 for information about other applicable programs.